Tonight marks the opening of the Sea Inside, a project centered around the topic of marine ecology and the crisis currently underway in our oceans. Sea Inside is the research and practice-driven project of Emily Carr University of Art + Design MAA candidate Marten Sims. The project features art exhibits, workshops and promotes open dialogue. Sea Inside is an exhibition and workshop series which draws on developments that have emerged from the holistic practices of transformation design, systems thinking and cultural activism. It examines ways in which the creative and artistic practices can assist to emphasize faltering interdependent systems and highlight positive relationships between humans and the ocean. Over forty contributors from Emily Carr University including students and faculty, as well as creative practitioners external to the institute have participated in the production and co-creation of this body of artwork and workshops. The exhibition opening reception takes place in Emily Carr’s concourse gallery space at 6pm tonight. 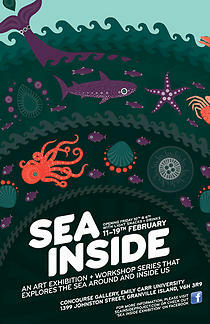 To learn more about Marten Sims’ project, visit the Sea Inside website.